Thanks for the very timely invitation to your blog party, Kate. Well, for romance writers, it's the middle of conference season, with the big one - the Romance Writers of America National Conference - just finished, the UK Romantic Novelists' Association Conference done and dusted a couple of weeks ago, and the Australian and New Zealand conferences almost upon us. Unfortunately, I'm not going to any of them this year, so I'm missing all those cool partyish things that happen at writing conferences and it's nice to have an alternative here on your blog. For those of you who don't go to writing conferences, I'm now going to wistfully describe a few of the things I'm missing out on. For those of you planning to go to a writing conference some day, I hope these descriptions are an encouragement rather than a turn-off. The first major event at the American conference is the huge book signing session known as the Literacy Autographing. Hundreds of authors - and I mean HUNDREDS - are arranged alphabetically at long rows of tables where they sign their books for three hours. If you're a big name author, you get a special table up the back and your line snakes out the door, through the hotel lobby, and around the corner into the next street. If you're a medium-sized name, you have a nice clutch of fans blocking access to the lesser names seated beside you. If you're not really much of a name at all YET, you sit there white faced, silent and alone, or else resort to standing on your chair and shamelessly bribing people with chocolate. But then you and your friends leave your assigned spots for a while and go around visiting each other, and when the event winds up you kick on for pizza in someone's room and have a great night and forget all about the fact that even with chocolate as an inducement, only five people wanted your book. On a more serious note, the books are donated by publishers and all money raised goes to support adult literacy. Each year it's around $50,000, and has added up to an impressive total over the years. The next social highlight at RWA National is the series of publisher parties on a Friday night. As I'm a Harlequin author, the Harlequin party is the one I get to go to. Some people gate-crash these parties, but I'm not a fan of that. Being a published author is hard, and a huge achievement, and there aren't that many perks, and going to the party is one of them, and if you manage to crash it before you're published then you're stealing your own sense of triumph once you've actually earned an official invitation. Sorry if that sounds a little grumpy! If you don't like dancing, then the Harlequin party is possibly not for you, published or not. The event is noisy, conversation is impossible unless the venue happens to offer quiet corridors or balconies off to the side. But the dancing, oh, the dancing! We get hot, we let our hair down, we rush onto the floor whenever our favourite songs come on, we forget the fact that we have revisions to work on as soon as the conference is over, we forget that we haven't clicked with our new editor yet - and sometimes we do click with her right there on the dance floor when it turns out we're both really embarrassing in our responses to Gloria Gaynor's "I Will Survive." At the Romance Writers of Australia conference, Friday night is cocktail party night, and it's a similarly frenzied occasion. There's a fancy dress motif to this one, each year, and the theme is always different. This year, I'm missing out on my chance to interpret the theme "Diamonds are a Girl's Best Friend" and I can only imagine how sparkly and glittery and glorious the evening is going to be. Oh dear, over 800 words, I think my time at your party is almost over, Kate. Wait, before I go, can I give away a book? 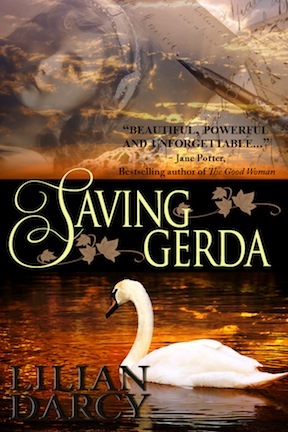 Anyone who makes a comment will go into the draw to win an electronic copy of my historical women's fiction novel "Saving Gerda." I haven't made it to an American conference yet. It all sounds so BIG! But I love our Aussie conferences. I remember some years ago talking to you in a lift and you showing me your RITA pin. I'm sure I looked dazed. I wanted to reach out and touch it! I'm a fan of your work but didn't realise you wrote historical. I've been missing out! Kate, congrats again on number 50! Lillian, what a fabulous description of the conference season! I'm sure that anyone who has never been will be hugely tempted. I was fortunate enough to make it to RWA last year (New York) and this year (California) and can reiterate everything you've said about the parties and the fun. Never made it to the Australian/NZ conferences yet, despite the temptation of friends there. Not sure I could cope with the jet lag! Lilian, I haven't made the RWA conf yet (sounds big ad scary!!) but I love the RNA one :) And I can't wait to read Saving Gerda - especially as we went to Vienna last year. One of my best memories is dancing at a Harlequin party in Denver with Lilian. Making me smile just thinking about it! Absolutely loved Saving Gerda - one of my best reads this year. Lillian, great to see you here. I have Saving Gerda on my Kindla :-) I have just got back from my second US RWA conference but it was the first time as a published author and it was exactly how you describe! Kate, it's so great to see you having a rockin' party for your 50th book. A great achievement. Loved reading about conference season. It made me even more excited bout attending RWAust next week - so sorry you won't be there! Okay, last time I checked in here there weren't any comments, and now I'm late replying! Robyn, I was probably pretty dazed about the Rita pin, too, quite proud of it. Kate, you should be getting yours! I wonder if they're still the same. Saving Gerda is my only historical, so far. It's sort of mainstream-y, and "indie" published - a challenging but really satisfying experience, so far. So glad you got to go this year, Sarah, and huge congratulations on your win. Can I try to tempt you to come to Oz/NZ? Come out a few days ahead of time. Try this line:- "I have to go to the Barrier Reef for a week before the conference to get over my jet lag." Work it, baby. Kate, yes, the American conference is big and scary, but exhilarating, too. Liz, one of my best memories, too. You are such a good dancer! And I was thrilled that you loved Saving Gerda so much. I've done a Createspace print edition now, and am really pleased with how it's turned out. Fiona, you're being too modest. You should have said, "first time as a Rita finalist and winner." Once again, serious congrats on that! Amy, hope you and everyone else has a great time at RWAust. Okay, this is getting way too long so I'd better stop. Thanks again for having me on here, Kate. Hope we get some more guests dropping in today! Lillian so sorry I won't get to see you at the RWAus this year. It's my first in five so I'm sure noone will regoncise me anyway ;). Cafe de Jour was just gorgeous. And I've heard such wonderful things about SAving Gerda its on my MUST BUY list! And yes, we need to get a bunch of the Brits down to Aus one of these years. I hear Jessica Hart's coming to Perth in 2013, so maybe...? Hope you have a great time, Ally. It would be great if we could get a whole British contingent out here for a conference! But maybe not for Perth, for distance reasons. Oh, I don't know, Lilian ... Perth sounds great to me! I've been to all three of the big conferences (RWA, RNA and RWAus) and I've got to say the Australian one was the best fun! Am really hoping to get to Western Australia next year - it's closer for those of us in the UK! So glad you thought ours was the best fun, Jessica! Perth would be wonderful, too, but I think it will be a smaller conference, as some people won't want to go over from the eastern states - airfares for that route can be quite steep. First name drawn from the hat for a copy of 'Saving Gerda' - Robyn Grady. Please contact me kate(dot)hardy(at)btinternet(dot)com with your snailmail addy, Robyn, and I'll get the book in the post to you :o) Thanks for taking part!